Choo-choo-choose a 1986 El Camino SS for $14,555! In Spanish, El Camino means the way. Today, Nice Price or Crack Pipe wants to know if $14,555 for a Choo-Choo El Camino makes you say no way. Well, the great pumpkin finally showed up yesterday, much to the joy of Linus and 39% of you. The other 61% thought it was okay until you got to the tumorous sound system and then things started going south. Today's car has a little south going on as well, but its in the form of the aftermarket trim package that makes this one rare ‘mino. It’s a Greater Little Car for $4,500! 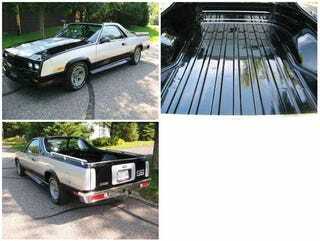 Hailing from Brainerd Minnesota comes this 1986 Chevy El Camino SS Choo-Choo with an asking price of $14,550. It has 36K on the clock and the claim that the bed has seen less use than Octomom's IUD. Now, you know what a Chevy is. You know that SS stands for Super Sport, which has been applied to some of the hairiest-scrotum'd cars Chevrolet could churn out. And you're no strangers to the venerated El Camino. But, you may not know what a Choo-Choo is. Well, that's okay, because we're here to help. Choo-choo is a pair of really expensive shoes. What? Jimmy who? Oh, okay. Choo-choo is what Fergie calls her lady parts. No? Damn. Alright, a Choo-Choo is. . . well, just watch this informative video, and the mystery will be all cleared up"
See? The Choo-Choo El Camino is a special edition made especially for the developmentally disabled. No, wait- that's not it. Actually, the Chattanooga-based Choo-Choo Customs, Inc. El Camino SS model was an after-market paint and tape package made available through the Chevrolet dealer network. They're typically identified by the paint scheme and the tiny steam engine badge applied to the nose and dashboard. Most of the Choo-Choo Customs El Camino SS's were not factory Super Sports, and the seller of this car doesn't state if it carries the RPO code Z15 that would identify it as a factory SS. If it's not, than it was turned into first an SS, and then into a Choo-Choo at Choo-Choo Customs, Inc's., factory down in the kudzu state. Production figures for 1986 show 995 Choo-Choo SS's built, and, out of that, 144 with the three-tone paint job sported on this car. Under that non-functional hood scoop resides an L69 305-cid Chevy V8 good for 180-bhp and backed up by a floor-shifted 3-speed auto. Lake pipes, chrome bed rails and Monte Carlo SS alloys round out the exterior aesthetic, while inside you get bucket seats and that great wrap-around rear window so reminiscent of a Dino 246's. So, it's rare, it's a ‘Mino, and it's in really nice shape. But is that enough to make you choo-choo-choose to pay $14,550 for it? Or, for that price, has this Choo-Choo gone off the tracks?